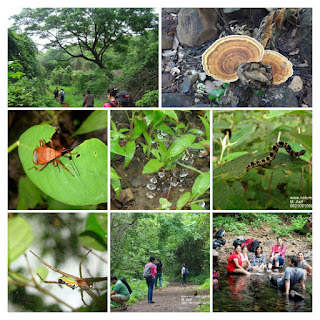 Trekking, Rock Climbing, Backpacking, Exploring Konkan Kada and Ancient Temple Complex, Wild Chefs and lot more.. Check video by some other group of the same trek.. Our own video to be shared soon. Travel to base village (Belpada). 2 hours drive. Trek to base of Nali (from Belpada).. approx 2 hours hike on flat land. Don't forget to carry you sleeping bags, lite woolens. Approx. 9 hours trek today. The trek from Base village to the top of Harishchandragad takes nearly 9 hours and it becomes essential to start out as early as possible at the first break of light. So, make an overnight camp in the base village of Belpada after arriving from Kalyan the night before. Today's trek involves short hike through grassland after the base village leading to the base of mountain. Where gradual ascend starts through the forest path taking you through stream bed and finally reach to the place where you can see the rocky trail leads up through the Nali. One needs to be extremely conscious while climbing after this point till the time they reach the first plateau just Harishchandragad, near Konkan Kada. Night dinner village food at offbeat dhaba. Board return train for Mumbai. Light snacks for trek (Chocolates, energy bars, dry fruits etc). No refund after December 1st, 2014.